With National Bike Month in full swing, thousands of kids all over the country are taking to the streets on their bicycles. 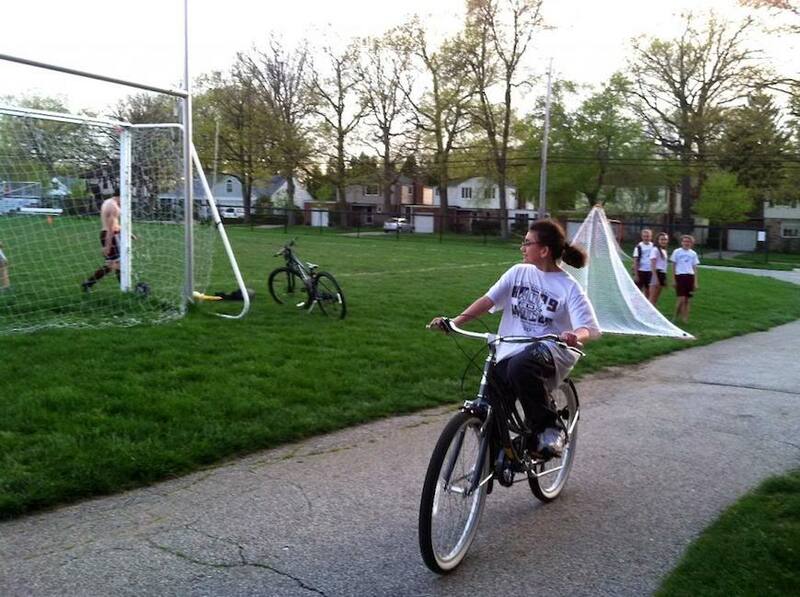 And in Northeastern Ohio, students are collectively pedaling enough miles to circumnavigate the globe. Twice. 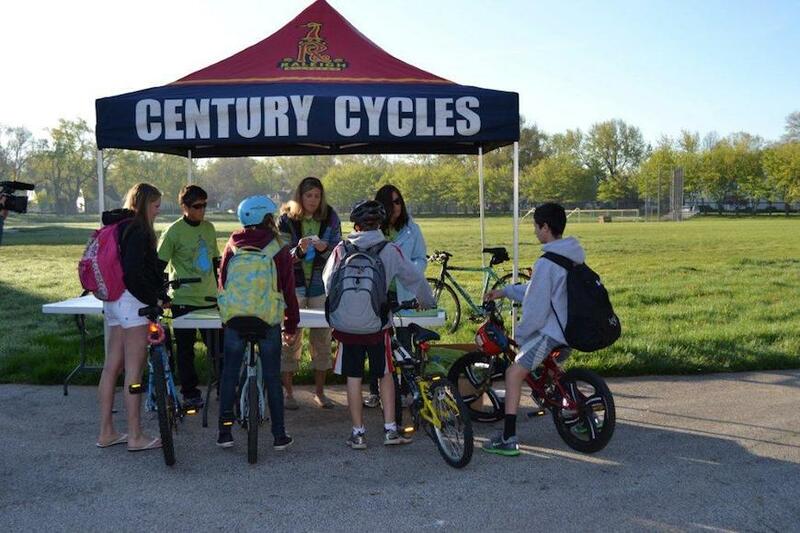 This year’s annual Century Cycles Bike to School Challenge began May 5th and runs for three weeks, rain or shine. With 4,000 students at six schools taking part in the challenge, daily bike counts and surveys are used to gauge participation, and students can compete for prizes from sponsors including Raleigh and PeopleforBikes. The Bike to School Challenge morning check in. Photo courtesy of Wendy Crites. While the event draws thousands of eager kids in an effort to encourage fitness, fun and sustainability, it is called a “challenge” for a reason. Many children get the opportunity to learn to ride a bike at an early age, but for one student that just wasn’t in the cards. Wendy Crites, a Teacher at Rocky River Middle School, remembers one particular 6th grader not participating in the challenge back in 2011. “Paityn has special needs, and she struggles with a fine motor delay condition which can cause difficulty in grasping onto and balancing on a bike,” said Wendy, who teaches health and fitness education. After watching her peers ride to school every day, enjoying in the fun and camaraderie between those who have mastered two-wheeled transit, Paityn decided that it was time to ride. “One day she approached me about really wanting to participate, but that she couldn’t ride her bike without ‘wrecking it.’ I told her that if she walked to school and had her parents confirm that she was practicing at home, I would give her a stamp.” Determined to participate, Paityn walked her bike to school nearly every day during the event. As the challenge neared the following year during Paityn’s last month of middle school, she approached Wendy again, but this time she was determined to ride. What unfolded was an incredible show of support and encouragement from her family, school employees, community members and event sponsors. After Wendy reached out to Century Cycles owner Scott Cowan, the plan was set into motion. With help from Raleigh, Scott was able to give Paityn a beautiful Raleigh cruiser bike, along with her very own instructor, Century Cycles employee Mike Petcher. Mike accompanied Paityn and her parents to Rocky River’s Linden Park, where he stood the bike at the top of a hill and had Paityn ride down without pedals (so that she could stop at any time). “They did this several times, then proceeded to try it with pedals,” recalled Paityn’s mom, Valerie. What she thought may not have been possible happened in less than an hour. Paityn started riding her bike, with pedals, all by herself. Paityn riding with confidence around Rocky River Middle School. Photo courtesy of Wendy Crites. Another teacher, Joyce Lampp, volunteered to ride with Paityn to school every day, and two weeks later when the Bike to School Challenge began, Paityn and Joyce were the first ones to pull up on their bikes at the check-in table. Paityn rode the 2.6 miles every day that she could to and from school during the three-week challenge. “Learning to ride a bike and having the closely supervised practice gave Paityn a new sense of freedom, independence, and self-confidence,” said Wendy. Paityn is just one student who benefited from the challenge. With the support from the community at large, Raleigh and Century Cycles hope to continue to grow the Bike to School Challenge to encourage more kids to get out and ride. Perhaps this year the kids will pedal themselves around the world a few more times. 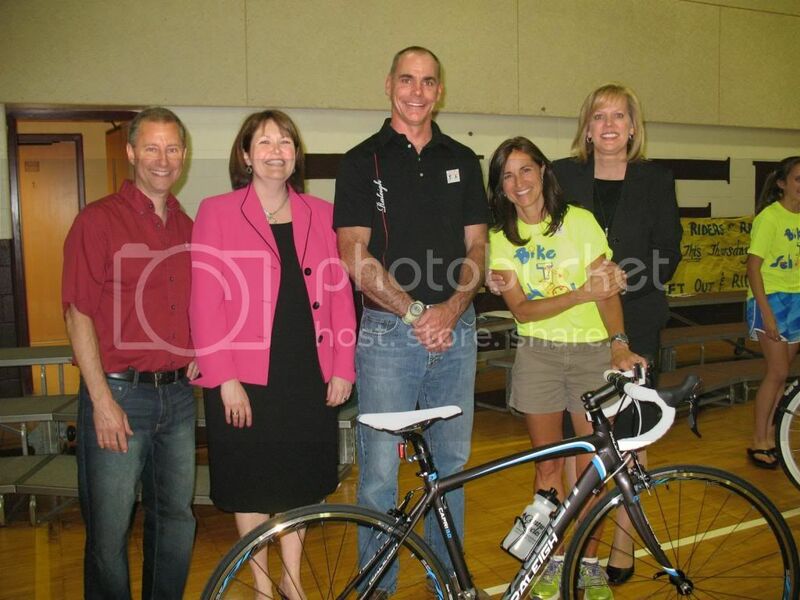 (From left) Scott Cowan/Century Cycles, Principal Megan Rose, Chris Speyer/ Raleigh Bicycles, RRMS Teacher Wendy Crites, and Mayor Pam Bobst.